Soundstream is much more than a screensaver. Since it's a plain Quartz Composition file (.qtz), you can use it anywhere you might use a QuickTime movie file (.mov)... such as Keynote 2 or later. Download the special Keynote .mov file. Essentially, this file is Soundstream converted to a .mov format with the splash screen and version checking disabled so neither pops up in the middle of your presentation. In Keynote, select "Choose…" from the Insert menu. Navigate to the Soundstream file you have just downloaded and choose it. Soundstream will be added to the current slide, though it will be completely transparent to start. 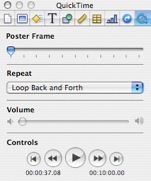 Select a poster frame in the QuickTime inspector so you can see Soundstream (note that Soundstream might look differently every time you revisit the slide). The default object size is 800 x 600 pixels; you may scale Soundstream any way you like. By default, Soundstream will play for ten minutes straight. If your slide will play for a longer time, you can use the Quicktime Inspector to have Soundstream start again or play in reverse when it reaches the end of a cycle. 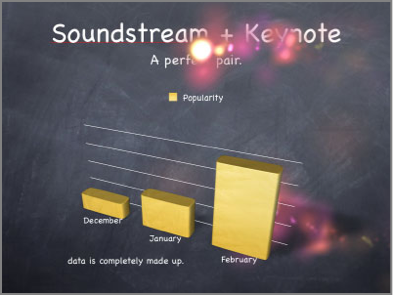 Soundstream's background is transparent in Keynote, so it will look best on a dark background. You may place Soundstream in any layer of your slide, putting it in front of or behind other objects; use the Arrange menu to bring Soundstream forward or backwards. And yes, this does work with other Quartz Compositions.